Jack Zylkin is the brains behind USB Typewriter. 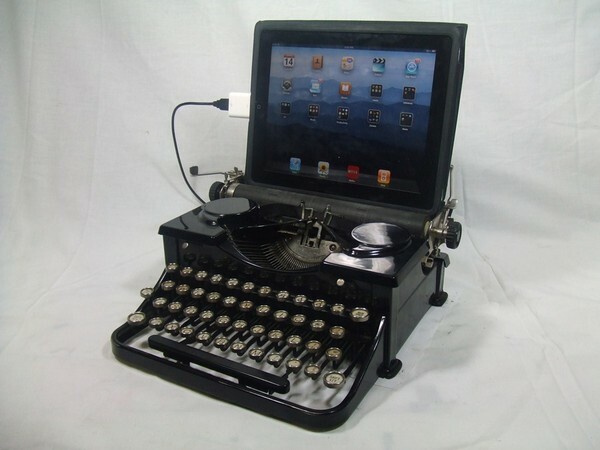 He takes vintage typewriters and modifies them to work as a USB keyboard for your PC, Mac or even your iPad. The modifications include many non-standard keys, such as F1-F12, via a special toggle key – who knew you could hit ‘Esc’ on a Remington?! The bit I like best is that the typewriters still operate as first intended – roll in a blank sheet of paper and you’re away, tappety-tap. Opening a new blank document on your computer simply does not have the same zing as rolling fresh paper into a typewriter and hitting ‘return’ on your computer does not match the ‘kerching’ of a returning typewriter carriage. Converted typewriters are available at Zylkin’s Etsy store, USB Typewriter. Prices begin at US$649. Also available is a DIY Conversion kit for US$69 – before you start scouring eBay for an inexpensive typewriter to convert, be aware that Zylkin recommends “intermediate skill with a soldering iron” and about seven spare hours to complete the project. USB Typewriter ships to Australia.